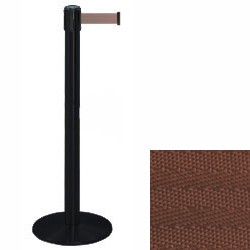 These stanchions with retractable brown belt are great for creating lines, separating areas and blocking entrances in public areas. Each post is made of sturdy metal with a black satin finish. 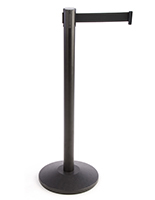 The stanchions with a retractable belt also include a weighted base for extra stability in high traffic environments. The crowd control poles featured here measure 38" tall and their nylon tape is 13' long and 2" wide. 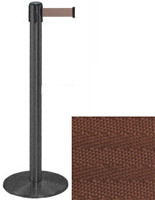 The stanchions have a 4-way adapter on top to connect to three other posts. This allows restaurants, stores and service organizations to great layouts of any size and complexity.